The Prince George’s County Fire and EMS Department’s “Adopt-A-Neighborhood” program was recognized in the Criminal Justice and Public Safety category. The Prince George’s County’s Department of Social Services was recognized in the Human Services category for their “Community Resource Advocate” program which is a part of the County’s Transforming Neighborhoods Initiative, County Executive Baker’s signature community-based program. In the County Administration Management category, the “Story of DPIE,” the creation of the County’s new Department of Permitting, Inspections, and Enforcement was recognized. In the Community/Economic Development Category, NACo recognized “The Prince George's County Department of Environment and Corvias Solutions Public-Private Partnership” for the County’s stormwater retrofitting program. The Prince George’s County Department of Public Works and Transportation’s “Public Private Partnership for Wetlands Restoration” was recognized in the County Resiliency: Infrastructure, Energy and Sustainability category. Started in 1970, NACo’s annual Achievement Award Program is designed to recognize innovative county government programs. Each nominee is judged on its own merits and not against other applications received. Nationally, awards are given in 21 different categories that reflect the vast, comprehensive services counties provide. The categories include children and youth, criminal justice, county administration, environmental protection, information technology, health, civic engagement and many more. NACo will recognize award-winning counties at its 2016 Annual Conference and Exposition July 22–25 in Los Angeles County, Calif. The Adopt-A-Neighborhood (AAN) program is a proactive program, collaboratively funded and operated, through the Prince George’s County Fire/EMS Department. Participating churches and businesses fund smoke alarms, carbon monoxide detectors, and awareness literature that the Fire/EMS Department provides to residents in targeted areas around Prince George’s County. Currently, there are eight (8) businesses and churches that have donated nearly $30,000 to cover the costs of the program. Materials and/or funds are donated to the Fire Chief’s non-profit Community Advisory Council, who then provides smoke alarms, CO detectors, and literature to the Fire/EMS Department. The program was launched when the Firefighters/Paramedics Union and clergy leadership agreed to donate smoke alarms and CO detectors after two fatal house fires. This assisted the County’s Fire/EMS Department with canvassing those specific neighborhoods, with both entities agreeing to provide meeting space for those communities to come together for proactive fire prevention and public education meetings. With the added use of technology to pinpoint target areas, since its inception the program has enabled an internet-based community tracking mechanism that allows donors to follow program effectiveness. This is the first program of its kind in this region and possibly across the country. For additional stories about our Adopt-A-Neighborhood program click here, here, here and here. As part of the Prince George’s County Executive’s signature Transforming Neighborhoods Initiative (TNI), in 2013, Prince George’s County Public Schools and the County Government launched a partnership designed to mitigate social issues that prevent at-risk youth from achieving academic success. This partnership is referred to as TNI@School. Thirty-one (31) schools currently are served through the TNI@School program. Through a signature element of the TNI@School program, the County Department of Social Services employs school-based personnel, Community Resource Advocates (CRAs), whose role is to connect students and their families to services and support systems, serve as a liaison for the County Department of Social Services and Prince George’s County Public Schools for foster youth and other students placed in their assigned schools, and otherwise support school administrators in mitigating social factors so that teachers can focus on academic enrichment. CRAs are located in each of the 31 schools served through TNI@School. During the 2014-2015 school year, the CRAs served over 1,937 students, of which 411 students received clinical behavioral health services; 446 students were enrolled in programs providing after school enrichment; 61 students received intensive case management for a variety of issues, and 563 students received college and career readiness services. So far in the 2015-2016 school year, CRAs have served over 961 students. The Department of Permitting, Inspections and Enforcement (commonly known as DPIE) is the newest department in Prince George’s County. DPIE was originally conceived as a response to continuing criticism of the County’s permitting and licensing processes lodged by representatives of the County’s economic development community. DPIE is the keynote initiative of County Executive Rushern L. Baker III for improving the County’s capacity to meet the needs of developers and businesses seeking permits and licenses from the County in a timely and proficient manner. DPIE brings together staff from nine County, bi-County, and State agencies under one-roof so that customers can access related services required for issuing a permit or license in one place. DPIE has achieved dramatic improvements in various service measures through organizational transformation, process improvement, technology enhancement, staffing optimization, office space rehabilitation, performance monitoring and reporting and staff recognition. This includes an 88 percent increase in revenues between fiscal years 2014 and 2016; a doubling of permit, plan review and inspection activity, and a 63-95 percent reduction in the time needed to process various permits and licenses. All this was accomplished without increasing staff or outsourcing. The Prince George’s County and Corvias Solutions Public-Private Partnership (P3), also called the Clean Water Partnership (CWP), is an agreement between County government and the private sector to retrofit up to 4,000 acres of impervious surfaces using green infrastructure. It’s the first-ever P3 model to address stormwater at this scale. The CWP will design, build, finance, operate, and maintain urban stormwater infrastructure in order to meet Prince George’s County’s Municipal Separate Storm Sewer System (MS4) permit compliance requirements. This pioneering P3 approach will leverage private sector best practices and efficiencies to deliver functional and sustainable stormwater infrastructure with accelerated project timelines and reduced costs. In Prince George’s County, the opportunities for creating wetlands and restoring streams are complicated by various constraints, including lack of suitable land within a highly urbanized watershed. The urbanization of the County includes roadways and associated infrastructure requiring maintenance and on occasion, widening and replacing bridge structures and roads in order to accommodate increased traffic capacity or safety needs. Inevitably, wetlands, stream habitats, and forest canopy may be negatively impacted by roadway and bridge improvement projects. Through the development of this innovative public-private partnership, we were able to access and utilize federal lands that had previously been unavailable to the County. This site had been used historically as a spray irrigation field (SIF) by the USDA. The entire 25 acre SIF will be restored including forested wetlands, uplands and low order, headwater streams. Prince George's County will be using approximately 5 acres of the SIF an additional 5+ acres will be restored to provide mitigation for other important transportation projects located in PGCO, with the balance restored using fees collected in lieu (ILF) by the Maryland Department of Environment for historic wetland impacts in the Anacostia Watershed. The National Fallen Firefighters Foundation (NFFF) knows the value of working 10-year smoke alarms. Not only do smoke alarms provide an early warning to residents of a fire in their home, they also allow for a faster notification to the Fire Department. The sooner firefighters can arrive and extinguish a home fire the better the chances that no one will be injured or killed. While the NFFF honors our fallen firefighters they also do their very best to prevent Line of Duty Deaths. Baltimore Gas & Electric annually donates thousands of dollars to local charities through their “Emergency Response and Safety Grants.” This year the National Fallen Firefighters Foundation was awarded a BG&E Grant to purchase smoke alarms to be distributed to Anne Arundel and Prince George’s County Fire Departments. The two departments have programs where firefighters will install these smoke alarms in homes free of charge. The NFFF has established a relationship with KIDDE, a leading manufacturer of smoke alarms, to allow for discounted pricing and donated alarms. The combination of a BG&E Grant and KIDDE’s generosity means that Anne Arundel and Prince George’s County will have additional 10-year smoke alarms to distribute, free of charge, to their residents, courtesy of the NFFF. All of the organizations mentioned above will gather to announce the Grant amount and number of smoke alarms to be distributed. Plenty of photo ops and interviews available. For citizens and residents of Prince George's County the purchase and use of backyard fireworks for the upcoming Fourth of July celebrations may be confusing. It is OK to purchase a Christmas Tree in another jurisdiction and bring home to the County. The same applies for roadside purchases of flowers, fruit, artwork, etc. As County residents travel around the region they will see roadside and parking lot booths set up promoting the sale and use of fireworks in neighboring jurisdictions. Stores sell fireworks also. You may ask whats up?? Prince George's County is one of three jurisdictions in Maryland that prohibit all consumer fireworks. This law is designed to protect you and those around you. Citizens, businesses and visitors should know that any consumer purchased fireworks are illegal in Prince George’s County. All fireworks from sparklers up to ground display are illegal - our law removes any doubt about what is permitted and what is not!!! All consumer fireworks are not permitted in Prince George's County. Consumer purchased backyard fireworks can cause injuries and damage from fires. Please enjoy your fireworks at one of the many public displays. Penalties for violation of this law carries up to $1,000 in fines and 6 months in jail. Enjoy Fourth of July safely and legally, attend a public or municipal display. To demonstrate the power of a seemingly innocent fire cracker I encourage you to watch this video. A small firecracker is inserted into a melon. Imagine you are holding this same firecracker in your hand when it explodes!!! Don't try this at home. These displays were conducted by members of the Fire/EMS Department Bomb Squad under strict safety guidelines!!! In 2011, fireworks caused an estimated 17,8000 reported fires, including 1,200 total structure fires, 400 vehicle fires, and 16,300 outside and other fires. These fires resulted in an estimated eight reported civilian deaths, 40 civilian injuries and $32 million in direct property damage. In 2011, U.S. hospital emergency rooms treated an estimated 9,600 people for fireworks related injuries; 61% of 2011 emergency room fireworks-related injuries were to the extremities and 34% were to the head. Over the past several years, during the July 4th week, there has not been any significant injury or property damage in Prince George's County from fireworks. Our fireworks law is a law we can live with!!! If you have purchased your own backyard fireworks and were not aware of the County Law, call 301-583-2200 and request a Fire Investigator to come by your residence to confiscate them. You will not be charged with a crime if you use this method of surrendering fireworks. On Independence Day, in a typical year, far more U.S. fires are reported than on any other day, and fireworks account for two out of five of those fires, more than any other cause of fires. Prince George’s County Firefighters have battled 3 separate fires over a 12-hour period that caused nearly $500,000 in estimated combined fire loss. 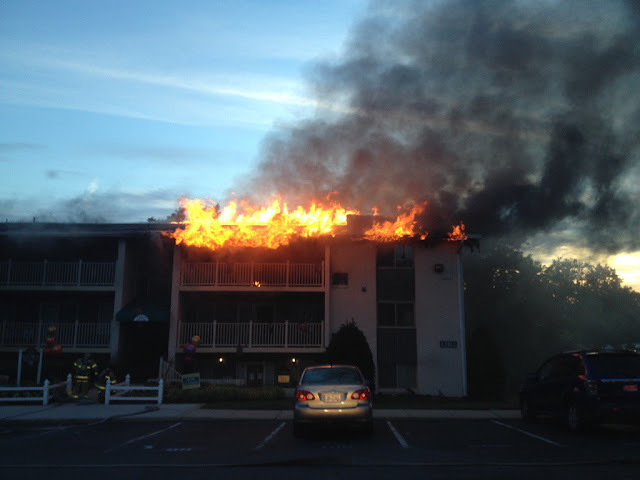 On Saturday evening, just before 8:30 pm, firefighters from the Laurel area were alerted to an apartment building on fire in the 13900 block of Briarwood Lane. Fire/EMS units arrived at the 3-story garden style apartment building with fire showing from the top floor and roof. A 2nd Alarm was immediately requested. Initial arriving units searched the building for occupants and initiated extinguishment of the fire. As the fire grew in intensity all firefighters were removed from the interior and the majority of the fire was knocked down from the safety of exterior positions. It required about 40 minutes to extinguish the fire. A firefighter from the Laurel Volunteer Fire Department fell from a ground ladder and was transported to a nearby hospital. The firefighter was experiencing pains in his chest area and was held overnight for observation. He is in Good condition. No civilian injuries were reported. Fire Investigators determined the fire originated on a 3rd floor balcony from improper disposal of smoking materials. The fire extended from the balcony and up into the roof of the building. Fire loss is estimated at $300,000. Nine apartments were declared uninhabitable and 22 occupants were displaced. The Red Cross provided assistance to the displaced residents. 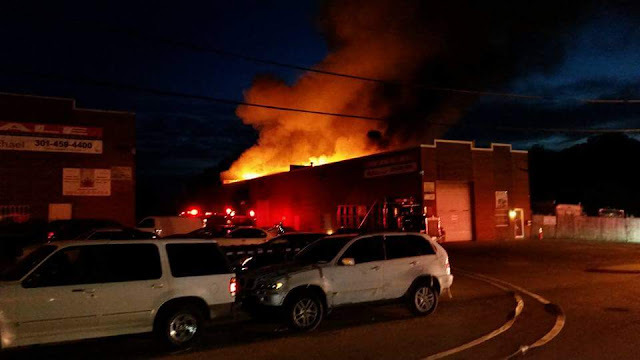 While the Laurel fire was still being extinguished firefighters from the Clinton area were alerted to a commercial building fire in the 7600 block of Barbara Lane just after 9:00 pm. Fire/EMS units arrived to find a 1-story warehouse occupied by an automotive repair business with fire and heavy smoke billowing from the structure. A 2nd Alarm was sounded bringing additional resources to the scene. At one point all firefighters were evacuated as the structure became unstable. The fire was extinguished from the safety of exterior positions. The structural integrity of the structure was compromised preventing fire investigators from conducting an interior review of the area of origin. According to an occupant the fire started accidentally while work was being done to a car inside the garage area. The cause of the fire will remain undetermined until additional investigation can be performed. Fire loss is estimated at $100,000. 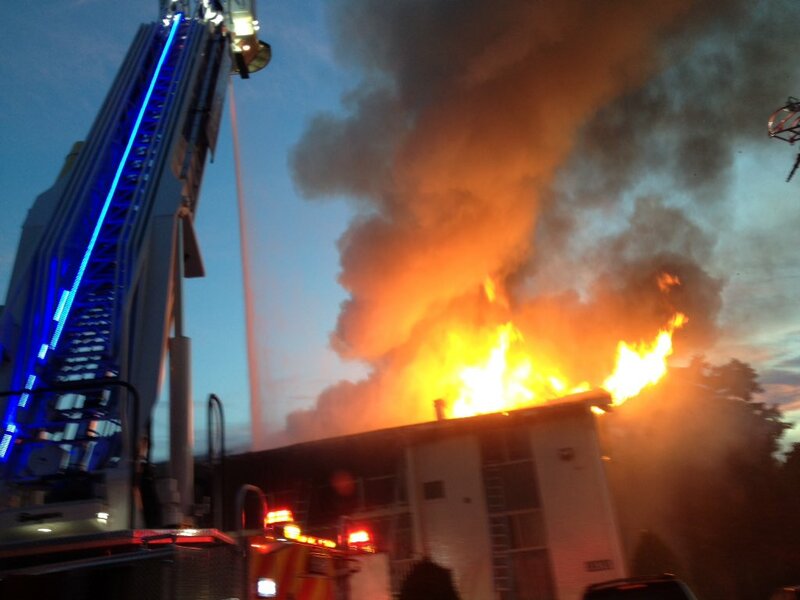 One firefighter sustained an ankle injury while battling this fire. There were no civilian injuries reported. Just after 8:30 am, Fathers Day, Sunday, June 19, firefighters from the Lanham area were alerted to a house fire in the 9300 block of Fontana Drive. Firefighters from the Landover Hills Fire/EMS Station were the first to arrive and encountered a 1-story garage converted to a living space with fire showing. The fire was quickly contained and all searches for occupants proved negative. The cause of this fire remains under investigation and a preliminary fire loss is estimated at $75,000. No injuries were reported at this incident. 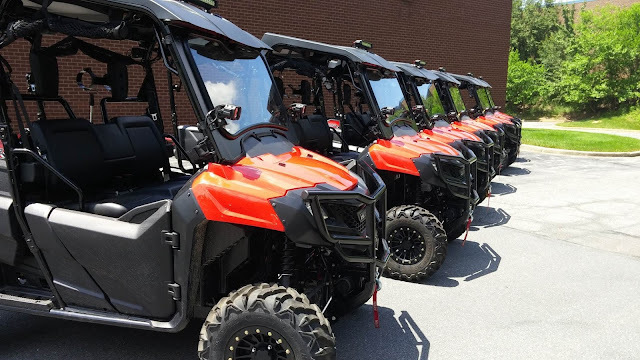 Prince George’s County has taken delivery of six Urban Terrain Vehicle (UTV) ambulances to improve patient access to remote locations and improve patient movement for austere environments. The UTV ambulances will be made available to high risk venues where the potential for mass casualty events can be anticipated, as well as being deployed as needed to respond to mass casualty events. 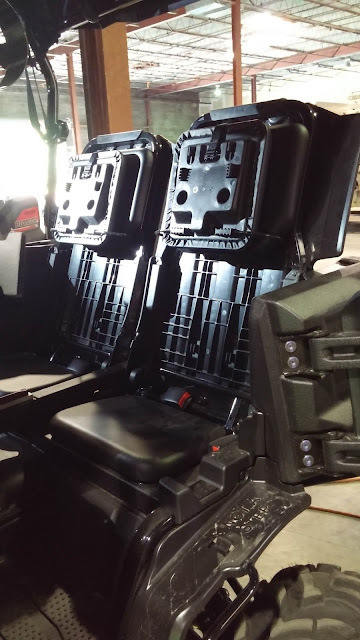 These vehicles have off road capability, increased scene lighting, powered wench, as well as a specifically designed patient transport area specific for rugged deployment and evacuation. They can be configured to transport a crew of four with gear to remote locations or can be configured to transport two to three providers and a patient. The wide range of versatility is one of the main reasons PGFD went with this design. Subject matter experts from the austere, Urban Search and Rescue (USAR), and wilderness medicine community helped design the carts for optimal effectiveness. Trailering systems were also purchased with these vehicles (not delivered yet). 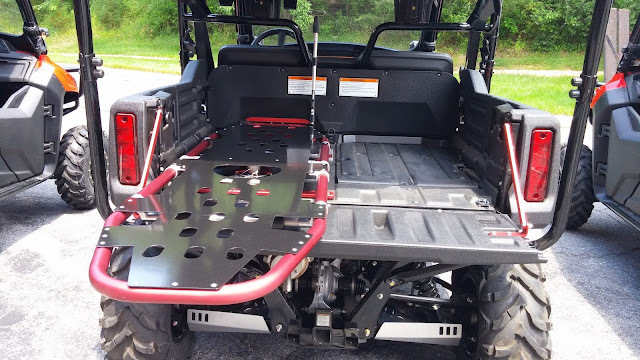 The UTV were delivered last month with up-fitting of the patient area being completed in early June. Four electric powered patient transport carts were also purchased to replace our fleet of electric carts at FedEx Field staffed by our special events unit (not delivered yet). 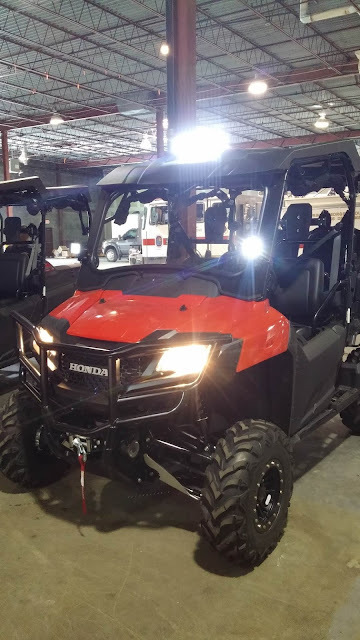 The six gas powered UTV’s will be housed in Central Prince George's County. The four electric carts will be housed at FedEx Field. Similar carts based upon these specifications will be delivered to other regional partners to promote interoperability and regional capability. A firefighter was injured and a vacant Landover Hills house sustained significant damage after a fire this afternoon. At around 12:45 pm, Wednesday, June 8, firefighters from Landover Hills and other surrounding departments were alerted to smoke coming from a house in the 6700 block of Dorman Street. First arriving firefighters from Landover Hills fire/EMS Station 830 advised of a 2-story structure with smoke showing. Firefighters advanced hose lines into the structure and conducted a search for occupants. All searches proved negative. The fire appears to have started on the 2nd floor and advanced into the attic area before it was extinguished. Winds were gusting at about 21 mph during this incident which helped to advance the fire. One firefighter from the Kentland Fire/EMS Station 833 required assistance of other firefighters in exiting out a 2nd floor window (see video below). He sustained minor burn injuries and suffering from exhaustion. The firefighter was treated by medics on the scene and transported to a Burn Unit for additional evaluation and treatment. It required about 90 minutes to extinguish the fire. The house is vacant so no one is displaced. The cause of the fire is under investigation and fire loss estimates are still being tabulated. No additional injuries were reported. All personnel involved in operations are required to have vital signs checked after they have completed their tasks and before returning to service.